The Amazon Fire HD 8 (2016) is a very exciting tablet since it starts at just 89,99 dollars. Especially Amazon Prime members are promised a great value for their money. It offers a couple of highlights for its price like an hd display, a battery life of up to 12 hours and a deep integration into the services of Amazon. How good is the Fire HD 8 (2016)? That’s what we want to find out with this review. Update: By now the Amazon Fire HD 8 2018 is available and I reviewed it already. The design of the Fire HD 8 (2016) is very similar to other Fire tablets that were released over the last couple of years. It’s completely black and as you might expect at this price point the body is made completely out of plastic. In my opinion it feels a bit better than the Lenovo Tab3 7 Essential but not as good as the Samsung Galaxy Tab A 7.0. With 9.2mm it is definitely not the thinnest device out there and not the lightest with 341g either. But the build is solid, so I don’t have a lot to complain here. On the back sits a 2 megapixel camera and a VGA webcam is positioned on the front. There’s a microUSB port and a MicroSD card slot which holds cards with a capacity of up to 200GB. Like you might have guessed from its name the Fire HD 8 has an 8 inch IPS display but unlike a lot of competitors at this price point it offers a relatively high resolution with 1280 x 800 pixel. Most tablets for under 100$ have a resolution of 1024 x 600. Obviously the pixel density is not as high as on a tablet with a full hd resolution or higher, like we see with the ASUS ZenPad 3 8.0 or Huawei MediaPad M3. But the quality is good enough. Viewing angles are quite good but colors don’t look as saturated as we are used to from more high-end devices. That’s not that noticeable if you’re watching dark movies or TV shows like the walking dead, more noticeable in comics or games with bright, saturated colors though. Inside runs a 1.3GHz quad core processor together with 1.5GB of RAM and an internal storage with a capacity of 16GB or 32GB. With the 16GB version you get about 11GB to use, the rest is used by the system. The specs do not sound that promising but actually the performance is better than I expected. On Geekbench 3 the Fire HD 8 gets around 650 points in the single core test and around 1850 to 1900 points in the multi core test. On AnTuTu the result is around 34500. So the results are better than with the cheaper Lenovo Tab3 7 Essential and better than the a bit more expensive Samsung Galaxy Tab A 7.0. In fact in those benchmarks the Fire is positioned just under a typical tablet with an Intel Atom x5 Z8300 chipset that usually is used in more expensive middleclass devices. Those usually get around 770 and 2200 points in Geekbench 3. So the performance is quite good, especially for that price. That’s what has been my impression in real life use as well. The Silk browser generally runs pretty smoothly as long as you don’t have too many tabs open. Games like Dead Trigger and even Star Wars: Knights of the old republic run without any problems. The graphic settings are adjusted automatically on most games, so Asphalt 8: Airborne is playable as well. While the Amazon Fire HD 8 (2016) is an android tablet it does not run the typical “Google Android” that we are used to. There are no apps from Google preinstalled and you don’t get access to the Google Play Store. Instead you can use the app store from Amazon and its other services for playing music, watching movies and tv shows or reading books. It still is android and you’ll find some similarities to other tablets. You can use the same apps as well, as long as they’re on offer inside the Amazon app store. Sometimes you can’t find an app though. Modern Combat 5 is not part of the app store for example. You’ll most likely enjoy the interface from Amazon if you are a prime member. That gives you easy access to all the offers like Instant Video. The interface is deeply integrated into Amazons services so I would recommend it if you’re a prime member only. According to Amazon the battery offers a runtime of up to 12 hours if you’re reading books, watching videos or are browsing the web. In fact this is an understatement according to my battery test. In my test the battery lasted 15 hours. I always do the same battery test by running a 720p video over and over again until the battery dies. Brightness is set to 50 percent, audio is turned off and Wifi is activated. There are no apps like Facebook installed which would send constant notifications. Obviously this is not a typical usage but it gives me a good starting point to compare the battery life of tablets that I’m testing. So while the display is a bit darker than higher end devices, the battery life is still pretty impressive. It might be that long since it’s probably not sending as much data to Amazon as other tablets are sending to Google – that’s just a guess though. Obviously the Amazon Fire HD 8 is not the best tablet out there. It offers a pretty good performance and long battery life for its price though. So I can recommend it if you are a prime member and are using services from Amazon like video streaming, kindle books or audible regularly. Otherwise I would recommend a “normal” tablet with Googles Android. 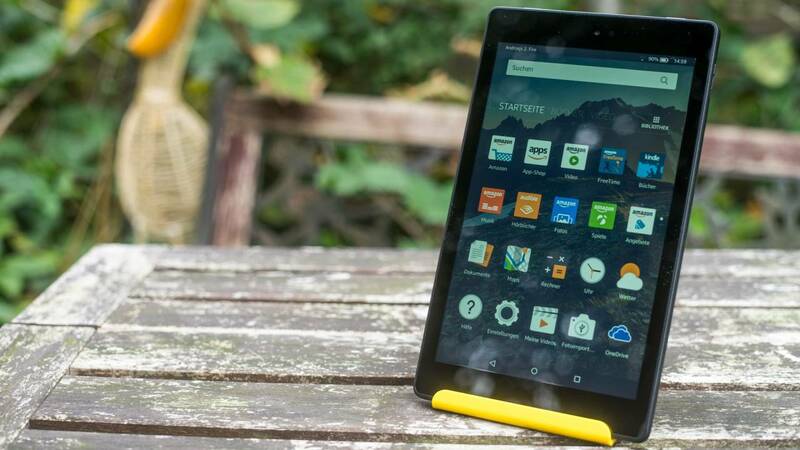 Amazon Fire HD 8 Review:Considering the price, the Amazon Fire HD 8 is a great tablet. Its highlights are a very good performance, long battery life and decent build quality. While it is an Android tablet, it's not Google's but Amazon's Android. So Google's apps are not officially supported.